Reducing Exposure to Airborne Hormones during Compounding - Sentry Air Systems, Inc. Hormone therapy is commonly used to treat menopause symptoms in women. Though research into hormone therapy and its long term health effects have posed differing results over time, it is still a popular option to many who are looking to ease the symptoms of menopause. One treatment for hormone therapy is the use of pharmaceutical compounding. You can view the complete list of the FDA-approved medications for menopause here. Common ingredients found in hormone therapy. While these hormones are naturally occurring in the human body, at elevated levels they can be toxic and have carcinogenic effects. The not-so hidden side effects for pharmacists. Hazardous exposure to workers may occur through inhalation of dust created during the powder grinding, mixing and encapsulation processes. Long term exposure to these hormones may cause an imbalance in levels resulting in adverse health effects. Causes human and animal mutations and has developmental reproductive effects. Reproductive effects include inhibition of egg implantation, suppression of spermatogenesis and impotence. A questionable human carcinogen, producing nonmalignant tumors in the liver. Causes developmental abnormalities and has serious effects on males including impotence, breast enlargement and spermatogenesis. Causes developmental changes in the urogenital system. How to reduce airborne hormone particles during compounding. OSHA recommends that specific measures be implemented to: reduce direct skin contact; reduce exposure via inhalation; and minimize the possibility of chemicals being brought home on workers’ clothing. Some examples include engineering controls (e.g., barriers and containments, laboratory hoods, glove boxes, and worker isolation); administrative controls; personal protective equipment (e.g., respirators, gloves and lab coats); and training. A ductless powder containment hood equipped with HEPA filtration is a portable, compact, and efficient solution to filtering renegade dust and powders during compounding. 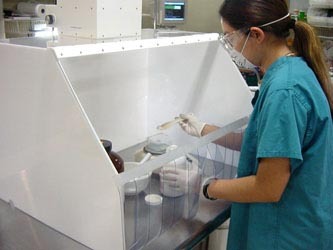 Sentry Air’s Pharmaceutical Powder Containment Hoods* utilize a powerful fan and filtration system that pulls harmful airborne powder and particulate away from the operator’s breathing zone and directly into the HEPA filter, which is up to 99.97% efficient on particles 0.3 microns and larger. By adding clear anti-static vinyl strip curtains, you better enclose the face opening of the hood while still allowing easy access inside. Our containment hoods come in a variety of sizes and can be customized to your unique application. Most of our powder containment hoods are sized to work well with Torpac® capsule fillers. *Our line of pharmaceutical powder containment hoods are not intended for sterile compounding applications. If you compound hormone therapy treatments in your pharmacy or would like more information about the health benefits of powder containment hoods, contact Sentry Air today. Give us a call at 800.799.4609, email sales@sentryair.com, visit our website www.sentryair.com or fill out the feedback form below. FDA’s pharmacy compounding Web page.